¨ A survey of ionizing radiation applications in Palestine was carried out in April-may, 1998. 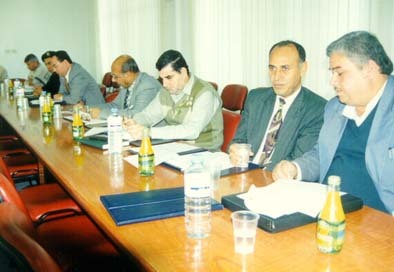 ¨ A setup of a strategic plan for 1999 – 2003 was laid out. ¨ Five days -training course in radiation protection for 25 local staffs was organized towards the end of June 1998. ¨ Preparing for a project focusing on the studying of the natural background radioactivity in Palestine. ¨ Preparing to carry out training program in x-ray photographing technique in cooperation with health ministry. ¨ Two workshops in Gaza and Ramallah on the projections of NERP in Palestine. ¨ Participating in scientific seminar for Technology osmosis Reverse use in a deslination in middle east center for desalination searches -Muskat -Oman, from 1/10/99 to 1998 . 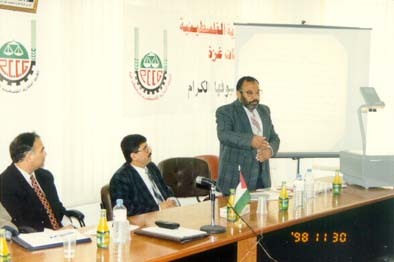 ¨ Organizing a scientific seminar in a desalination field in the precense of 15 representatives from Palestinian institution at the last of February 1999 . ¨ workshops were organized with regard to nuclear energy and protection department in Gaza Ramallah in Nov ,Dec subsequently with the presence of institution ,and ministries partners . ¨ participating in media seminar for nuclear energy and peace application . ¨Organizing a special training Course in the radiation and waste management ,from 21to 27 June 1998 in Cooperation with scientific faculty in Islamic university -Gaza 25 participants has participated from several governmental and non governmental institutions . ¨It has participated also in the national training course in the field of environment health data management ,by using CDS/ ISIS from 14.to 19 August , which was organized by Palestinian health ministry . ¨ participating in the fourth international conference of water technology from 5/8 march .1999 in Alexandria ..